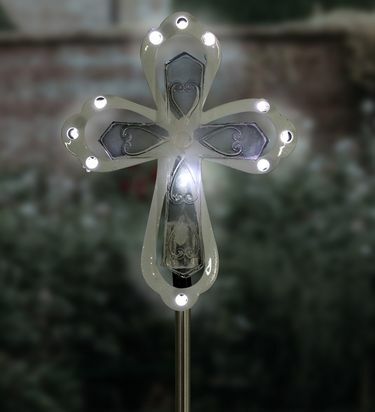 Express your faith with this exquisitely designed Solar Acrylic and Metal Cross Garden Stake. As the sun sets and dusk settles in, watch your Cross automatically glow with 12 LED lights. Makes a beautiful and thoughtful gift! Instantely adds a tough of elegance to any outdoor space. Made of durable acrylic and metal for long term enjoyement.